Turkey doesn’t have to be a traumatic ordeal. There are two crucial words to remember when making this holiday centerpiece: TIMING and BRINING. Timing: decide when you want to serve the bird and plan your time backward accordingly so you can move at an easy and efficient pace. Brining: this is a must! It is only one extra step in preparation and it makes a whole world of difference in keeping the turkey ultra moist. As far as presentations go, that is entirely up to you. In this case, I’ve placed the bird on a simple bed of parsley, surrounded by grapefruit wedges. The simpler, the better, in my opinion… after all the, the bird is the star, and she can be a Prima Donna! 1. Prepare the brine (do this step one day ahead). In a large stockpot, combine the water, salt, sugar, peppercorns, and bay leaves. Bring to a boil, stirring to dissolve the solids, then remove from heat and cool to room temperature. Transfer to refrigerator until well chilled. 2. The night before, or early on the day of cooking, combine the chilled brine and another 1 gallon of cold water in a clean 5-gallon bucket. Place the turkey, breast side down, into the brine. Cover and refrigerate (or place in a cool area if you can’t fit it into the fridge) for at least 6 hours. 3. Preheat the oven to 500F. Remove the turkey from the brine and rinse it inside and out with cold water. Discard the brine. Place the bird into the roasting pan and pat dry with paper towels. Season the inside cavity with salt and pepper. 4. Stuff the rosemary, grapefruit, orange, lemon, and apple wedges into the turkey. Tuck back the wings and rub the whole bird with a liberal amount of oil. 5. Roast on the lowest level of the oven at 500F for 30 minutes. Remove from oven and cover the breast with a double layer of aluminum foil. Pour the chicken broth into the roasting pan. 6. Reduce oven heat down to 350F and continue to roast another 10 minutes more for each pound of weight, until the breast meat registers 161F on an instant-read thermometer. Every 30 minutes, baste the turkey with the drippings in the pan. 7. Allow the turkey to rest, loosely covered with foil, for at least 30 minutes before carving. The larger the bird, the longer the rest. 8. Make the gravy. In a small saucepan over low heat, melt the butter and then add the flour to make a roux. Cook, stirring constantly, for about 2 minutes until thoroughly combined and to remove the raw flour taste. Gradually whisk in the reserved turkey drippings in a slow and steady stream until smoothly combined. Whisk constantly to prevent any lumps, and continue to cook until gravy is thickened. 9. Wasn’t that easy? Now go eat! * If possible, roast the turkey with the legs pointed toward the back of the oven. Ovens are usually hotter in the back, and since dark meat takes longer to cook than the white, by keeping the breast in front it will help keep from over-cooking. 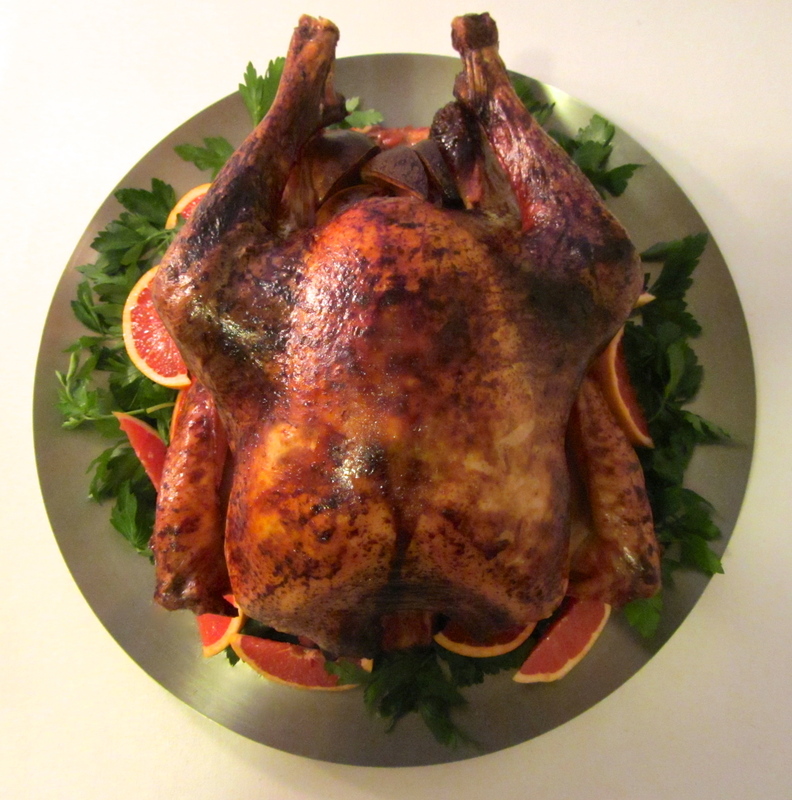 * I prefer to stuff with citrus fruits because as the bird roasts, they steam it from the inside, helping to make a moister turkey. * Basting double time: using your hands, gently separate the skin from the breast meat, being careful not to tear the skin. Slice pats of butter and stuff them under the skin so they will melt into the breast meat while roasting. * No need to truss the legs together; leaving the legs open allows the heat to circulate around the bird more freely, which makes for quicker and more even cooking. * If your gravy becomes too thick after cooking, simply whisk in some more chicken stock to thin it back out.